The recipe for this bread was devised by William Alexander during his stay at Saint-Wandrille Abbey in Normandy. As related in his book, 52 loaves, the monks had been baking their own bread for ages but their baker had left two years earlier and since none of the remaining monks possessed the necessary skills, they were happy to have a baker come and make “un peu de pain pour la communauté” (some bread for the community). They wrote that they would also be grateful if their helpful guest could show one of them how to make bread. Not feeling qualified enough, Alexander almost wrote back to say he couldn’t possibly live up to the monks’ expectations but then he reflected: “I wasn’t just being asked to train a monk or to bake some bread; I was being asked to repair a broken thirteen-hundred-year old chain, to return fresh bread to this abbey, to reignite a tradition what had tragically been extinguished. It was an opportunity to repay a debt, to do for this abbey what the abbeys of Europe once did for the rest of us – keep knowledge alive during dark times….” You’ve got to love a man who thinks like that! Once at the Abbey, he discovered the monks were reluctant to commit to the rigorous feeding schedule of a levain (although I wonder why… What did the monks use in the old days but levain?). They agreed however to feed the one he had brought them on the nights preceding baking days. Alexander didn’t argue, he adapted his recipe for fresh yeast (with a bit of levain thrown it for flavor) and, two years later, at the writing of the book, the monks were still baking his bread three days a week and hadn’t gone back to the local baker. They even asked for brioche and croissant recipes! If their village baker made bread that was anything like the one we sampled last year in France near Bourg-en-Bresse, I fully understand why the monks were calling for help. We had stopped for breakfast in a tiny village on our way to visit an old mill. The owner of the café told us that she didn’t have any bread but that we could cross the street and buy some from the bakery and that she would happily provide us with butter and jam. So I went to the bakery where I observed with amazement voluminous loaves which looked like oval balloons: the label said they weighed 1-kg but they were gigantic. Logically they should have weighed much more. I bought a half-baguette which I brought back to the café. We tried it. It was very white and bland and its texture recalled that of cotton candy. Apparently the village baker had mastered the dubious art of producing the worst possible kind of French bread by using no preferment and mixing the dough at high speed. Well, the monks were lucky enough to have all necessary (albeit rather old-fashioned) baking equipment on the premises and their determination to go back to “real” bread paid off. The “pain de l’Abbaye” is of the quiet variety (just like them) but it delivers. It has lovely rustic undertones, thanks to the addition of whole wheat and whole rye, and the combination of poolish and levain gives it a satisfying complexity. It rises beautifully in the oven and bakes to a ruddy burnish. 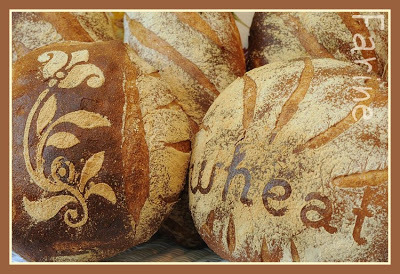 I baked a big batch as I needed bread to give away, to bring to a party and to freeze and I had fun with the shaping and the stenciling. Alexander reports that the monks insisted on a blunt-end cylinder shape with no points “so that everyone gets the same-size piece”. I guess the monks are nothing but egalitarian! I didn’t have the same concern (some of us – meaning myself – love the pointy ends while some others – meaning my significant other – don’t – how lucky is that! ), so the blunt shape wasn’t a requirement. I tried however to make my ends as rounded as possible. I had to make my loaves shorter than the monks’ as my oven is rather small and they ended up stubbier. As it is, I settled on 7 680-g loaves (raw weight): 4 short and fat bâtards and 3 boules (one of the boules weighed a tad more, 710 g, I think). 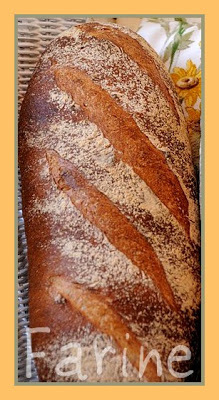 Only six loaves can be seen on the photos as one was given away while still warm from the oven. The last loaf was rather overproofed even though I had tried to delay things by putting the dough to ferment in the cool basement. The day was pretty hot and incipient summer weather does make a huge difference in fermentation time. Generally speaking the loaves all ended up proofing a bit too fast. Maybe for that reason, I didn’t get all the holes I was hoping for in the crumb. It could also be because I used more whole grain than indicated, both in the poolish and in the levain. Anyway like the Olympic torch, the burning desire for the perfect Abbey loaf has now passed on to me and this summer I plan to forge ahead in my own quest for the holey crumb. I also plan to tweak the recipe a bit by adding no commercial yeast at all in the final dough. William Alexander has kindly allowed me to post the original recipe (which is in the book but not on his website). The recipe you’ll find below is my adaptation. I used all organic flours and grains. I pretty much followed the indications given by Alexander in the original recipe, except that I did the autolyse before adding the salt (salt tightens the gluten networks, slowing down their development, which is the opposite of what the autolyse is supposed to achieve. See Hamelman’s Bread, page 9). Alexander may have the monks add it earlier so that they don’t forget it later (as happened to him once). I also did one fold after one hour and another one 30 minutes later. I also baked at 475 F instead of 500 as my oven gets really hot and at 500 F, the bread turns dark before it is fully baked. Le pain de l’Abbaye Saint-Wandrille goes to Susan, from Wild Yeast for Yeastpotting. 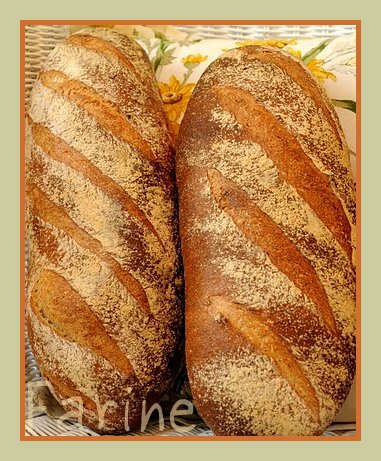 Thanks for posting your Pain de l'Abbaye Saint-Wandrille bake. 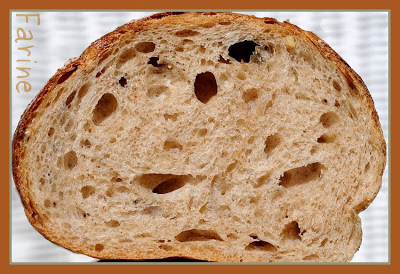 I am curious as to how a bread with both poolish and levain preferment tastes like. The breads do look wonderful. Hi Don, thanks for stopping by. I am glad you enjoyed the book as much as I did. Your question is a difficult one to answer: I could taste the levain in the bread but it wasn't too assertive. The poolish was more elusive but still added a delicate note. What I don't much care for is the addition of yeast in the final dough. I will definitely skip that next time, which should help slow down the fermentation a bit. Otherwise since I tasted JT's winning combination of three different preferments, I am all for trying different variations on the theme. I would have to check but I seem to remember that the baguette which won the US 1st place at Europain a few years back combined different preferments, didn't it? These loaves are tremendous! I love the designs you put on them! Thanks, Joanne! I had a lot of fun. 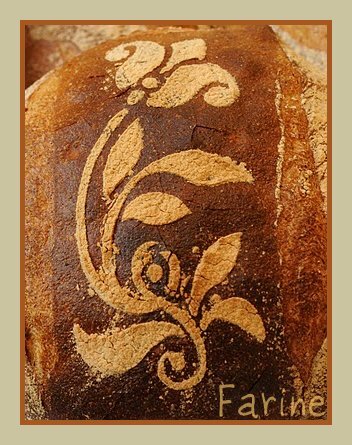 Your beautiful stenciled breads caught my eye over at Yeastspotting~ I'm with Sally; we would love to see a bread stenciling tutorial on your blog! Those loaves are absolutely beautiful and I bet they taste fantastic! Thanks, Frieda! Good idea. I'll try to put something together this July. Thank you, Heather. Yes, they are quite tasty! I'll definitely make them again. Thank you, Mimi! Glad you liked the stories. Alexander's is truly amazing. Talk about a dedicated home baker! 52 Loaves has been on my list for a while, I guess you've just moved it to first place now. All this makes for such wonderful bread story! Always makes my heart sing. Je suis contente que tu sois de retour, ton pain est merveilleux. J'aimerais bien a y gouter. What gorgeous looking loaves! I just finished reading 52 Loaves as well..it is a deightful book. Now I must follow in your footsteps and bake the Pain de l'Abbaye Saint-Wandrille. The stencilling is stunningly beautiful! And the crumb looks wonderful too. What loft you achieved. Bravissima. What a wonderful post – thanks for sharing the story and the photos. 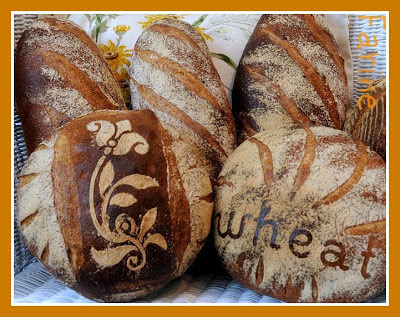 The loaves are all so beautiful, and the stencilled one is *gorgeous*. I'd like to try and find that stencil – I was wondering if you know who made it, or remember where you bought it? Thanks so much! 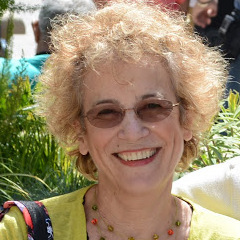 I do so enjoy your site and your baking, writing and photography. Thank you for your kind words, Anonymous. I believe I got the stencil from Michael's, the arts and crafts store. It was a while ago but they might still carry it or another one like it. Good luck finding it! MC, Thank you for your reply. 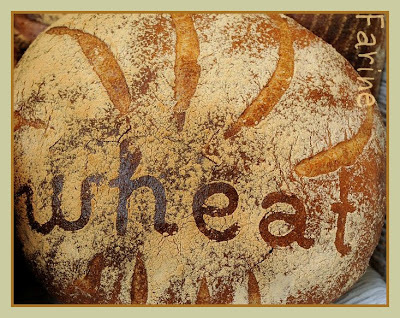 You sure do have an eye for beauty – this really shows in the breads you create! 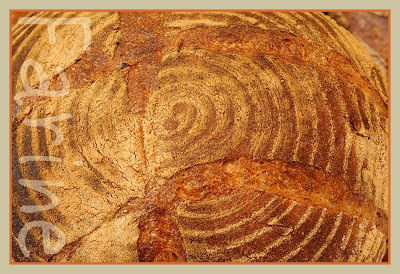 What stunning bread — and such an interesting story about its origin. I'd not heard of this book before, so need to add it to my list which never seems to end. I don't bake bread often, but I'm slowly learning…You've got a great website and clearly, a talent for making bread. Thank you so much for your kind words, kellypea! I hope you enjoy the book when you get to it. I sure did!